Strategic thinking is defined as the capacity for thinking conceptually, imaginatively, systematically, and opportunistically about the attainment of success in the future. To make the transition into the C-suite, leaders must have a broader, more holistic view of the business. Leaders in the C-suite have developed an ability to understand the dynamics, challenges, and implications of decisions across functions. They have developed a proficiency in business fundamentals and strategy. They break down silos and seek opportunities to collaborate strategically and creatively to address challenges that affect the organization holistically. In short, these leaders successfully move from tactical execution to strategic thinking and decision making. Because of the increasing complexity of business environments, the CEO of today must rely on his or her C-suite team for thoughtful counsel. There is an expectation that those in the C-suite are capable of releasing narrow agendas in support of the broader good to achieve market differentiation and competitive advantage. 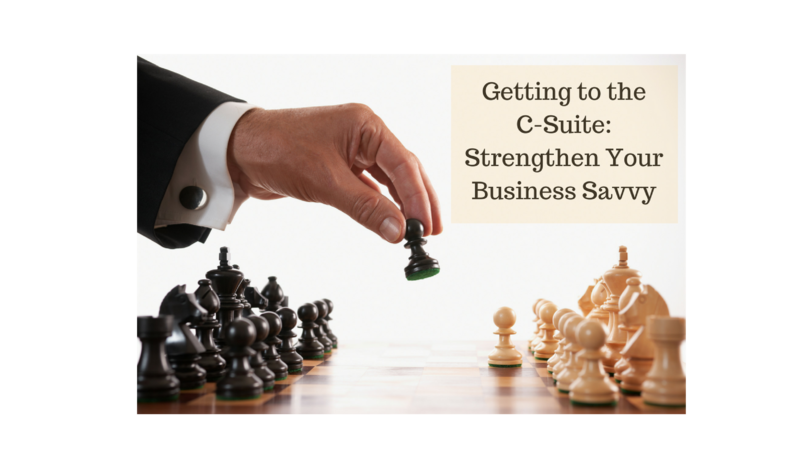 To be a viable candidate for the C-suite, you must strengthen your understanding and application of expertise to the entire business. Step outside your comfort zone. There’s great power in learning to be comfortable in your discomfort. That tends to separate leaders from followers. Seek experiences such as a task force or other initiative of strategic importance that provide you with a broader understanding of the business and its challenges and opportunities. Boldly identify ways to promote new growth, new markets, new go-to-market strategies, and new efficiencies. Ask others, particularly people outside your function, how they think about those challenges and opportunities. Notice how decisions get made. Leverage the diverse talent across functions for a more holistic approach to the market. Pay attention to the questions you ask yourself and others. Do these questions promote more innovative and strategic thinking? Do they promote deeper understanding? Ask yourself how you are defining success. What would cause success in a particular situation? Most importantly, get in the habit of considering what is possible versus why it can’t be done.